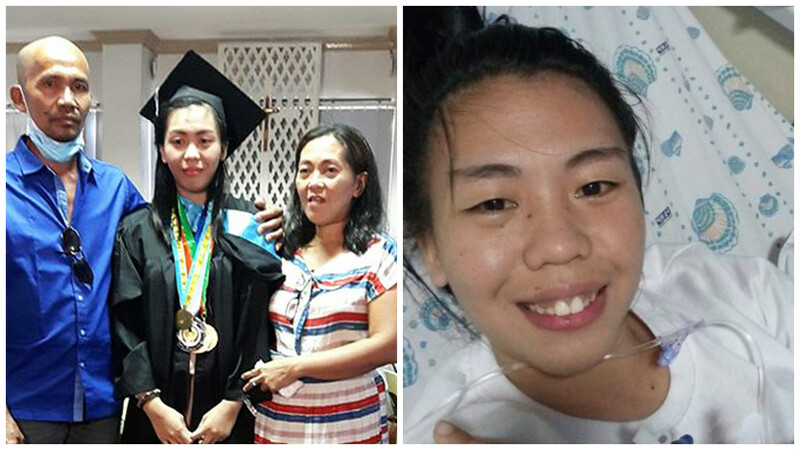 CAGAYAN DE ORO, Philippines - A special graduation ceremony was held on Tuesday, March 14 inside a hospital in Cagayan de Oro City for a graduating student diagnosed with leukemia. School officials of Rizal Technological University (RTU) in Mandaluyong decided to give Maria Julpha Villa a special commencement exercises inside a hospital where she is being treated for her condition. Villa, a 20-year-old student who finished her studies to get a Bachelor of Science in Physical Education, has been confined in the hospital after being diagnosed with stage 4 acute mylogenous leukemia or cancer of the blood and bone marrow in February. Months before her graduation, Maria Julpha Villa was diagnosed with stage 4 leukemia. According to RTU President Dr. Jesus Rodrigo Torres, school officials wanted Villa as well as her parents to be able to mark the fulfilment of her studies, which she worked to complete for years. Villa has been a scholar of the said university for 4 years because of her skills in arnis, a Filipino martial arts. Villa received her diploma and medal of excellence during the one-of-a-kind graduation rites. In a video clip shared by ABS-CBN News, school representatives hospital staff, family and friends of the new graduate were all emotional as Villa received her diploma clad in cap and toga in an intimate ceremony inside the hospital. Villa also received a medal of excellence during the one-of-a-kind graduation rites. The university’s actual commencement exercises was supposed to be held on May 25. But because of her condition, Villa wasn’t expecting to attend one of the most important milestones of her life. Villa revealed that despite the challenges she is currently facing, she hopes to overcome her disease and eventually fulfil her dream of becoming a teacher. A photo of Villa receiving her diploma was shared on Twitter amassing over 5,000 retweets and over 33,000 likes. A fundraiser has been set-up to help support Villa’s fight against leukemia.